Hey everybody! I'm back with another fun challenge from TGIF today! If you missed my announcement last week... I am thrilled to say that I have been invited to join the amazing design team over at TGIF Challenges and this is my second week joining in the fun! 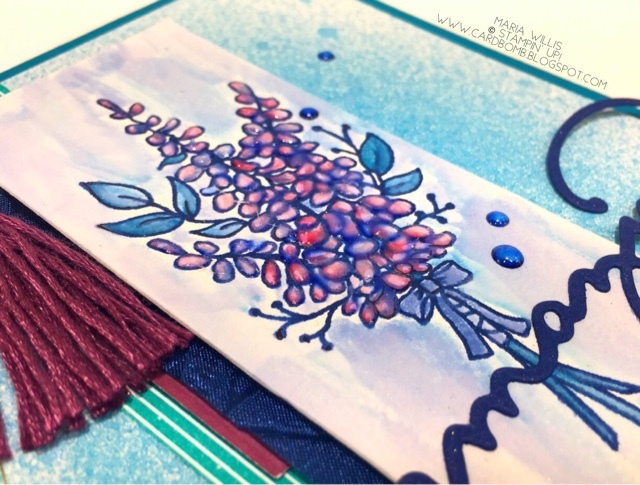 I used Fresh Fig, Island Indigo and Night of Navy with my Aquapainter to watercolor in this image from a new stamp set called Lots of Lavender (147194). During Sale-A-Bration/SAB (happening now) you can get this set for FREE with any $50 purchase! I like free stuff so I find this to be pretty amazing. After watercoloring the image, I used my Fine-tip Glue pen to add a thick layer of adhesive to the image. It added some nice texture and shine without hiding the watercoloring. That strip of DSP is also in the new SAB catalog and is another one of your "freebie" choices. These framelits are also new and in the SAB catalog (yep, FREE with a $100 purchase!) and they are "amazing." Those beautiful little embellishments are actually clear (new in the Occasions catalog) and I've colored them with my Night of Navy Stampin' Blends alcohol marker. My background is Shimmery White Cardstock spritzed with an alcohol and Island Indigo ink mixture. That's it for today. Please let me know if you have any questions. 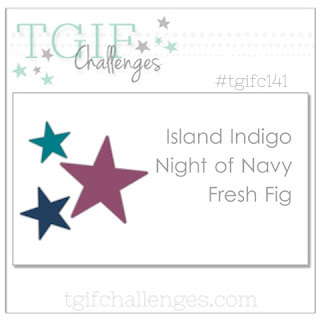 We would love to have you play along with #TGIF141 for this week's color challenge. If you'd like to play along, or, just check out what the rest of the Design Team has made then head on over to the TGIF Challenges Blog to see some other fun projects. Thanks for stopping by my blog today. It's always great to have you! If you're interested in purchasing any of the supplies I've used in today's project please let me know or click the "shop online" button below. I'm here to answer any questions that you may have. 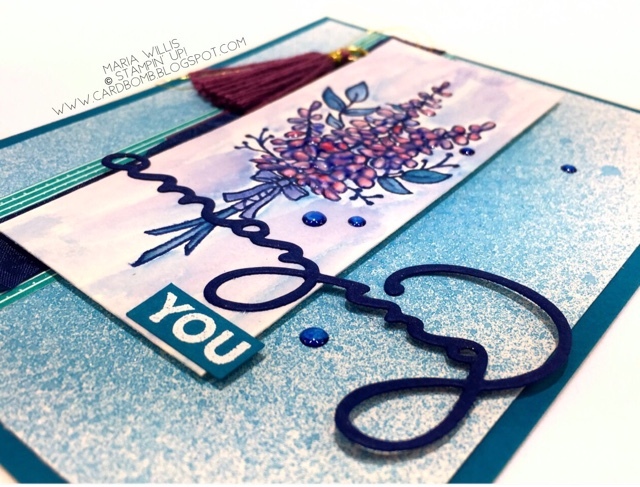 Maria your card is absolutely gorgeous! Your use of colour really makes the lavender pop. So great to see you on the TGIF team, looking forward to seeing more of your makes. Thank you Joanne! I'm excited to be part of the team and thanks for visiting my blog today!